July 2015 – Interested in Learning How to Find, Select and Eventually Live On Board Your Own Sailboat? You're in the Right Place…. Hello again…..as a follow up to the update regarding our subscriber database woes, I have discovered that we are unable to import our subscriber database from the old plugin…..I thought I would make it easier to “re-subscribe” by inserting the subscription box in a post…..If everyone could please use this subscription box …..
We can resume our normally scheduled operations…..haha…..since we weren’t able to have our April giveaway everyone who “re-subscribes” will be entered into a drawing for a prize as described on our home page….. I find myself in the all too familiar position of issuing an apology. Our former plugin that maintained and sent email updates was written by a company called “Readygraph” unfortunately this “plugin” (really just a name for a behind the scenes app for a blog) hasn’t functioned properly since April. The creators seem unconcerned despite my weekly emails to them and they have failed to do anything to correct the situation. Due to this malfunction and subsequent lack of repair we have been forced to install a new plugin created by “Jetpack” which seems to be much more solidly written and should give years of reliable service. This is where my apology comes in…..currently there is no way to import the prior subscriber list, so if you receive this email update please take the time to re-enter your email in our new subscription widget (another fancy name for a sidebar tool) and your updates will go on without interruption. We will try to import the whole list and as soon as that happens we will update this post. Thank you for your patience !! So, when we last left our intrepid sailors they had departed St. Augustine and arrived in Fernandina Beach……. We spent an uneventful night at the Fernandina Beach Marina and after carefully evaluating the weather forecast which was predicting East winds 5-10 shifting to ESE (East Southeast) at 5 – 10 later in the day and Seas were predicted at 3′. Here’s the first lesson to take from that….the National Weather Service (NWS) is frequently wrong….the prediction of weather and the sea state, while generally very good, isn’t as exact an art/science as anyone might hope. It’s a good idea to be always be prepared for something worse than predicted. On nearly every occasion, with the exception of our first trip from Fernandina to Georgetown, SC, the forecast has been milder than what we actually encountered. We had debated moving the dinghy from the arch davits onto the deck but since the forecast was mild and we had made this passage before with the dinghy still hanging on the stern we decided to keep her there…..bad idea, but more on that in a moment. Armed with this mild forecast, (and some advice from a local charter fisherman to go out with the tide) we decided to depart Fernandina as the tide was going out. As we entered the channel between the Fernandina inlet jetties, the incoming waves were somewhere between 8′ and 10’…with a wave period of what seemed to be about 5 seconds…..not a fun ride….on the upside it took us over an hour to clear the jetties…..so the ride was long AND uncomfortable…..needless to say, we were not anticipating such a rough exit from this inlet. I ended up wrestling with the dinghy in the rough waves inside the jetties, while Mike piloted, to avoid any damage. I later came up with a system of lines to hold the dinghy more stationary using the hoist as a way to tension the whole arrangement. The upside was Kitty Hawk took all of that in stride without a hiccup. Our last exit from here in May of 2014 was as smooth as glass. Once we reached a point beyond the jetties we turned Northeast to reduce the hobby horsing of the boat. This made the ride much better, but we then encountered what I can only assume was every single fishing vessel in the Fernandina and surrounding area fleets making a continuous two mile circle North to South and back again with fishing nets deployed. We made our best effort to keep at least a quarter mile away from any of the fishing vessels, which added yet another hour of maneuvering to our timetable. Most of the vessels weren’t monitoring channel 16, so verifying their navigational intentions was somewhat challenging. 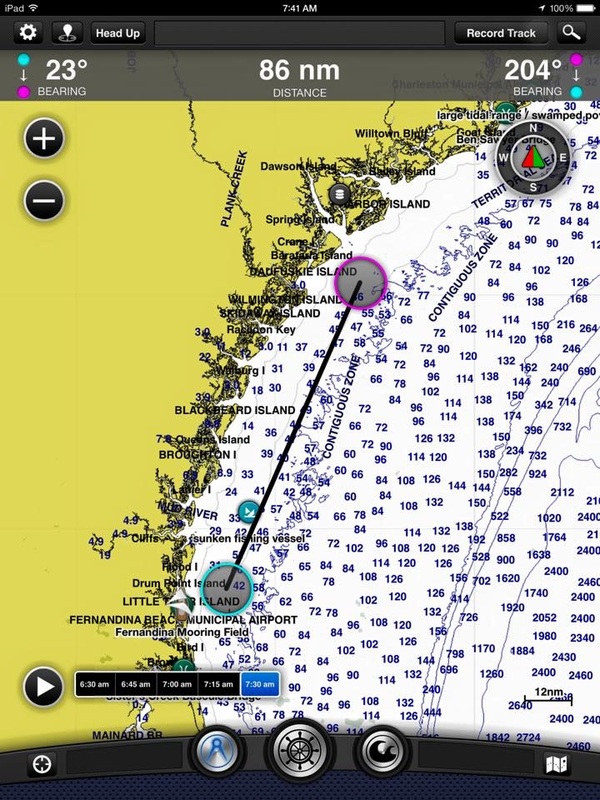 The Captains that were monitoring channel 16 were helpful and assisted us with estimating the length of the nets being used by nearby vessels to avoid any entanglement. According to one fishing boat Captain, the fishing boats are often short handed and once they pick a channel on which to communicate with boats they are affiliated with they frequently don’t scan 16 or switch back with any regularity. Once we we cleared the fishing fleet the remainder of the day was uneventful. The wind was more ENE (East Northeast and never shifted to East or much less ESE or SSE so strike #2 for the NWS) so, even though we had sails up, we were so close hauled that we didn’t get much benefit from them so we motor sailed. We also discovered that our wind indicator had somehow become bent and wasn’t completely accurate. The upside was that despite the unfavorable wind, the seas were down to 5′-6’…..the NWS weather broadcast continued to predict East winds shifting to ESE winds at 5-10 which never happened……..
Here’s a short video of some of the milder conditions….at the end of day #2 of our offshore passage….. 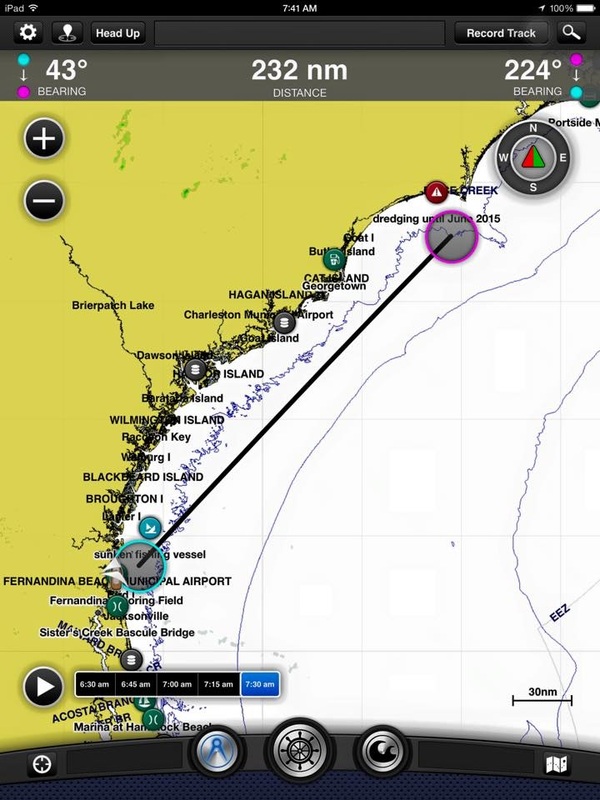 Since the weather was mild despite the somewhat rolling sea state and unfavorable wind direction, we decided to make the entire offshore passage to Cape Fear which took about 50 hours total. we had planned a bailout to Beaufort that we could have easily made on the morning of day #2. This was the Beaufort contingency….. This was our general course for the two day trip…..while we were generally on a heading of 43 to 45 degrees the wind was coming from about 65 degrees as opposed to the forecast 90 to 135 degrees…..
During the second night, we saw three or four low flying jets firing what appeared to be flares or countermeasures as they streaked back and forth across the night sky. 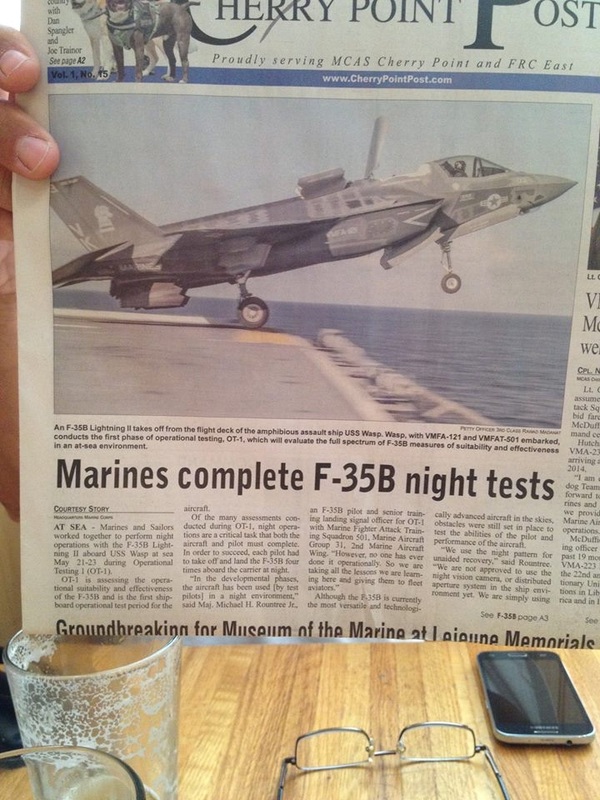 As it turns out, we got the opportunity to see the Marine Corp night testing of the new F-35B fighter jets….pretty cool. Our arrival at Cape Fear was again (fortunately) uneventful and we made it all the way to Joyner Marina in Carolina Beach, NC…….coming up next….The Home Stretch begins ! !